Thanks for taking the first step towards bringing Talent Activation to your organization! Please enter your information and select the checkbox below to receive new episodes from the blog directly to your inbox. Yes, hook me up with MARCUS BUCKINGHAM Blog new episodes! I also want updates from the LOVE+WORK community — for individuals who want to know how to find love in their work. This is the last episode in a new series on Data Fluency. You can also watch the first episode, the second episode, the third episode, or the fourth episode. In essence, we wanted to learn what conditions exist on the most productive teams. It would tell us a lot about employee engagement and leader effectiveness – but the question remained, how can you measure the feelings that the high-performing teams had, but that the low-performing teams didn’t? Here’s how we started: We asked question, after question, after question to the high-performers and the low-performers. These had to be questions about the individual’s own intentions and experiences (to avoid the Idiosyncratic Rater Effect), so none of them asked the individual to rate someone else on anything. Lastly, we needed these questions to predict positive outcomes in the future. If someone answered “Agree” or “Strongly Agree” to a question, they needed to have higher performance or retention down the road. When we did that, we ended up with these 8 questions. That’s what good data looks like, and that’s what you need to go through to get it. It will take about ten years to have confidence in the data, but if your company is making talent decisions – how to pay you, who to fire, when to promote – having data that actually validly predicts future performance is more than helpful – it’s necessary. 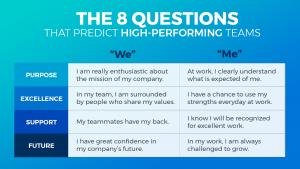 These eight questions are used in the Engagement Pulse, a part of StandOut – the technology solution to Talent Activation. To learn more, go to www.TMBC.com or click here. We Can’t See Where the Work Happens. That’s a Problem. Performance Management is two things. In the real world of performance, frequency is everything. To accelerate performance, solve for coaching, not feedback. What Creates Range in Performance? How Many People Should You Manage? Why Do We Fear Our Weaknesses? Data Fluency Series: Do Current HR Tools Give Us Good Data? EPISODE 60 | How Many People Should You Manage? EPISODE 30 | Why Do We Fear Our Weaknesses? EPISODE 27 | Do Millennials Want Feedback? EPISODE 26 | What Creates Range in Performance? EPISODE 20 | Data Fluency Series: Do Current HR Tools Give Us Good Data? EPISODE 8 | What is Talent Activation? EPISODE 5 | To accelerate performance, solve for coaching, not feedback. EPISODE 4 | In the real world of performance, frequency is everything. EPISODE 3 | Performance Management is two things. EPISODE 2 | We Can’t See Where the Work Happens. That’s a Problem. EPISODE 1 | Let’s get real. A bi-weekly dose of inspiration on leadership, loving your work, and groundbreaking strengths-based research.